Remember the Sega Nomad? The portable Megadrive / Genesis that let you play your favorite cartridges for 15-30 minutes at a time before having to change batteries? Well now Blaze International is releasing a product that has all of the fun of the Sega Nomad without all of that pesky cartridge nonsense. The 16bit Megadrive, releasing this month in the UK, features 20 built-in games, a color LCD screen, and a TV out so you can hook it up to your PAL television. The games included aren't bad for the price. You get Shinobi, Eco the Dolphin, Sonic and Knuckles, Altered Beast, Golden Axe, and several others, all for £29.99 - the price of a DS game. While I would have preferred they sneak a cartridge port on their for good measure, the game selection isn't bad and the price is right. Hit the jump for the full game list and additional details. 24th July 2008 News Release FOR IMMEDIATE DISTRIBUTION Blaze International Goes Retro with The 16-Bit Blaze Handheld Console with 20 Built in SEGA Megadrive Games! Handheld Console containing Sonic and Knuckles, Golden Axe, Shinobi, Ecco the Dolphin, Columns and 15 more superb retro titles for only £29.99 is set to take the market by storm! At last! 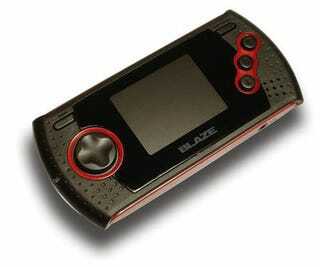 BLAZE are proud to announce they will be releasing their 16bit Megadrive handheld console in July 2008. The Blaze portable game player will be heading to a store near you from next month, so mums and dads, if you missed playing Sega Megadrive classics such as Sonic and Knuckles, Golden Axe, Shinobi and Ecco the Dolphin, you now have a chance to do so again... in all their portable glory... and all for the price of a single Nintendo DS game! Other games to be hooked on again include Alex Kidd - Enchanted Castle, Alien Storm Altered Beast, Arrow Flash, Crackdown, Decap Attack, Dr Robotnik's Mean Bean Machine, Ecco Junior, Flicky, Gain Ground, Jewel Master, Kid Chameleon, Sonic Spinball and Shadow Dancer. ...All very 90's retro chic and far less damaging to your reputation than singing along to Color ME Bad.....Though not everything from the 90's should make a comeback...are you listening Spice Girls? Watch a demonstration video and see gameplay footage at http://www.segaretro.net Now the serious stuff: Features Plug & play portable video game system 20 built-in 16-bit SEGA licensed games Built-in speakers Build in colour LCD screen TV out connection TV format: PAL Requires: 3 x AAA batteries. (Batteries not included) Description The Blaze Portable game console is a video game player, which is pre-loaded with 20 classic games from SEGA. There is therefore no need to buy game cartridges. The blaze Portable game player has an A/V connector and with the included cable the player can be connected to any TV set. Enjoy playing classic SEGA games anytime, anywhere with the new Blaze Portable video game player. Presented in stylish blister packaging. Watch out for more BLAZE product announcements from BLAZE and ATGames soon.... Available now from all leading games stores and online at www.segaretro.net for just £29.99 (+ P&P) Got a cheat video...Why not upload it to the nets largest cheat, tips and tricks community video channel www.youcheats.net – It's like Youtube for game cheats!